Monday morning, I checked out of The Backpack and made my way to the Cape Town headquarters of Nomad Adventure Tours, an overland tour company similar to Oasis. 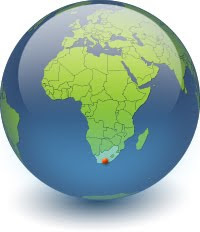 I had booked a 20-day tour with them from Cape Town to Johannesburg. The formalities were minimal compared to Oasis – I signed a few forms, boarded the truck with the other passengers, and we drove away from Cape Town. Most of the information about Nomad and the truck was to come at our campsite that night. 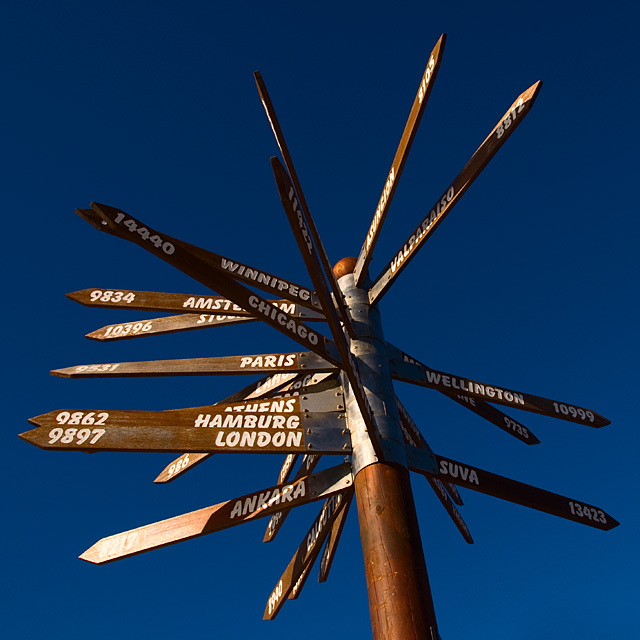 There are twelve of us on the tour – seven Dutch passengers, two Swedish couples, and me. Our South African guide, Chad, told us that it is unusual for practically the whole group to be Dutch. There are a lot of Dutch tourists in South Africa because of the country's history, but usually there is a greater mix of nationalities on the Nomad tours. This group is calmer and quieter than the passengers on my last tour. Oasis has a reputation as a party truck, and a lot of my English and Aussie friends drank most evenings. As fun as the Oasis trip was, this is a nice change of pace. The Nomad truck has a very different setup from the Oasis one, and this changes the dynamic of the trip. The Oasis truck had open sides, two rows of facing seats, and the social "beach" at the front. This layout encouraged conversation and road games, and we often had music blasting out of the truck's speakers. Oasis also has a generally more participatory nature. Two truck guards had to stay behind every time we had a shopping or lunch break in a town, and truck keys were safeguarded by two passengers at a time. The biggest difference was that rotating cook groups were responsible for food shopping, cooking group meals, and cleaning the truck in the evening. Nomad, on the other hand, requires almost nothing of its passengers, and it is a much more luxurious trip, at least to my lowered standards of luxury. As our guide and cook, Chad prepares three meals a day for us, and the food is delicious. We have cereal and real milk – both were too expensive elsewhere in Africa to have as options on Oasis. We also have a fridge on the Nomad truck that allows us to keep milk and other perishables. Chad and our driver both keep truck keys, and it is always easy to find them if I need to get into the truck. The truck itself is designed more like a bus, with forward-facing seats, glass windows, and no special feature like the "beach". We store our luggage in open racks above the seats, which are easier to access than the under-seat lockers on Oasis, but probably less secure. Most journeys on the Nomad truck are pretty quiet, as the forward-facing seats make it difficult to talk to everyone, and we generally don't play music. Wind does not blow through the truck like it did through the open sides in the Oasis truck, so the trip is much calmer. Luckily, this being winter in South Africa, the truck doesn't get hot with its closed sides. As nice as a lot of these features are on the Nomad trip, I miss the Oasis truck – after all, it was home for two and a half months. The first part of the Nomad tour would take us on the Garden Route, a scenic stretch of the coastline to the east of Cape Town. Our first stop after departing Cape Town was Stellenbosch, where I had been a week ago with Oasis. This time we had only a short stop – one wine tasting session. We also viewed the cheetahs at a nearby animal sanctuary. After that, it was on to our first campsite in the beautiful countryside around Swellendam. we had a leisurely evening as we waited for Chad to prepare dinner, and I organized some of my photos, something I have not had time to do in recent weeks. We also learned how to set up our tents. They are similar to the Oasis tents, but a bit larger and slightly more awkward to set up. The poles are not strung together, so it is easier to drop one while setting up the tent frame. The zippers stick, and the rain covers don't fit well. But to make up for some of these shortcomings, Nomad provides cushy mattress pads, and there are so few passengers that we can each use two if the ground is rough. As with Oasis, we share a tent with one other person, and my tent buddy is a medical student from Amsterdam named Wesley. 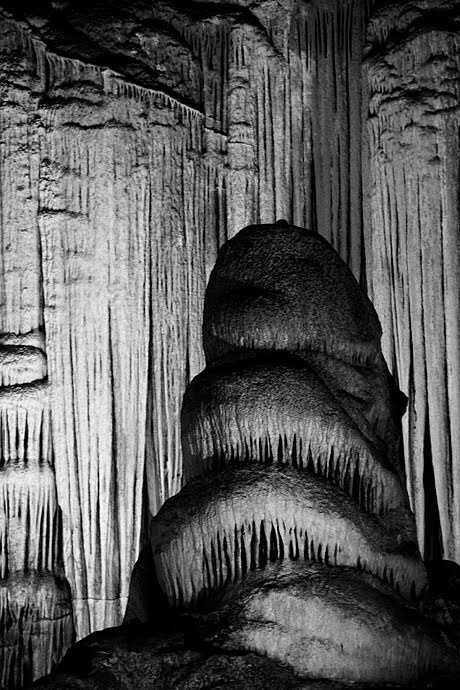 Yesterday, we drove about four hours from Swellendam to the Cango Caves near Oudtshoorn. 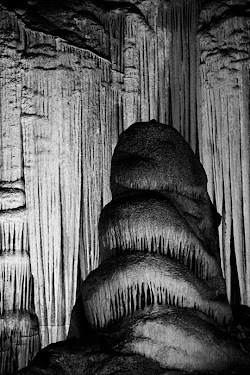 We took a guided tour through some of the impressive chambers of the cave system with their intricate rock formations. Next, we headed to the nearby Cango Ostrich Show Farm, where we learned some interesting facts about the massive birds and had the opportunity to try riding one. Ostriches are easily capable of killing a human – that huge claw on their foot can split a person down the middle just like a velociraptor. 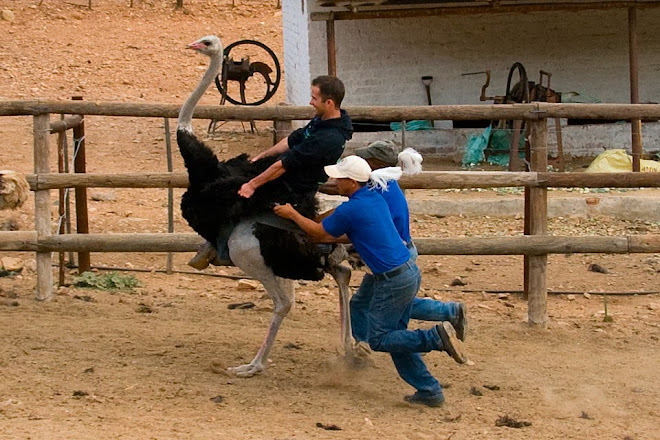 To keep an ostrich calm while mounting, a jockey places a bag over the bird's head. Ostriches may be potentially dangerous, but they aren't very intelligent: the bird thinks that if it can't see you through the bag, then you can't see it, so it remains calm and still. Two jockeys helped me climb onto the ostrich from a raised platform. They told me to squeeze my legs around the chest of the bird, hold on to its wings, and lean back. The bag was lifted from the ostrich's head, and the bird backed out from the mounting platform and ran frantically around the corral, while the two jockeys ran alongside the bird. After a few laps around the corral, one of the jockeys told me to just slide of the bird's back, and each jockey caught me by one of my arms. Some of the people who rode the ostrich before me thought the experience was terrifying, but I didn't find it that scary or uncomfortable. I held on tight to the wings and squeezed with my legs, and I never felt like I was going to fall off. In fact, I think I prefer riding an ostrich to riding a horse – at least you don't have quite as far to fall if anything goes wrong. After riding an ostrich, I bought some ostrich biltong in the shop. Biltong is a traditional South African snack of cured meat similar to beef jerky. Biltong is available in many varieties – regular beef, springbok, kudu, even crocodile. The ostrich biltong was quite tasty and was better than the rubbery ostrich meat I had tried in Zimbabwe. We camped in Oudtshoorn last night and left this morning to drive to Knysna on the coast. Along the way, we stopped at the picturesque Outeniqua Pass to admire the wrinkled landscape tumbling down towards the Indian Ocean. When we arrived in Knysna, we set up our tents and had some time to walk around the town. 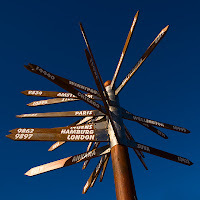 I enjoyed an ice cream down at the waterfront and studied a large sign with arrows indicating the distance to cities around the world – it made me realize just how far away from home I really was! After a while, we boarded a boat for a sunset cruise around the large estuary. It was a nice, relaxing ride with a pleasant view of the two large headlands, know simply as the Heads, that serve as the gateway to the open ocean beyond. We returned to our campsite after dark, ate one of Chad's scrumptious meals, and avoided the damp cold by warming ourselves by the campfire. As we were eating, Chad noticed a spider near the fire – it was a venomous black button spider, known in the rest of the world as a black widow. After dinner, I retired to my tent and tried to keep out the cold and any spiders by bundling up tight in my warm sleeping bag. wow. I want to ride an Ostrich!